Do Dogs Get Homesick? What Are Symptoms Of A Dog Being Homesick ? Dogs always seem happy as long as they are around their owners. It looks like you can go anywhere with your dog and he will still feel at home. This, however, isn’t always the case. Dogs, just like humans, get homesick. Our furry friends are creatures of routine and habit. Disrupting their routine might have some adverse results in their behavior. They also tend to get used to the smells, sounds, and visuals around them. They might even get attached to a favorite toy. One of the common triggers for homesickness in dogs is traveling. Spending too much time away from home might cause your dog to start missing home. 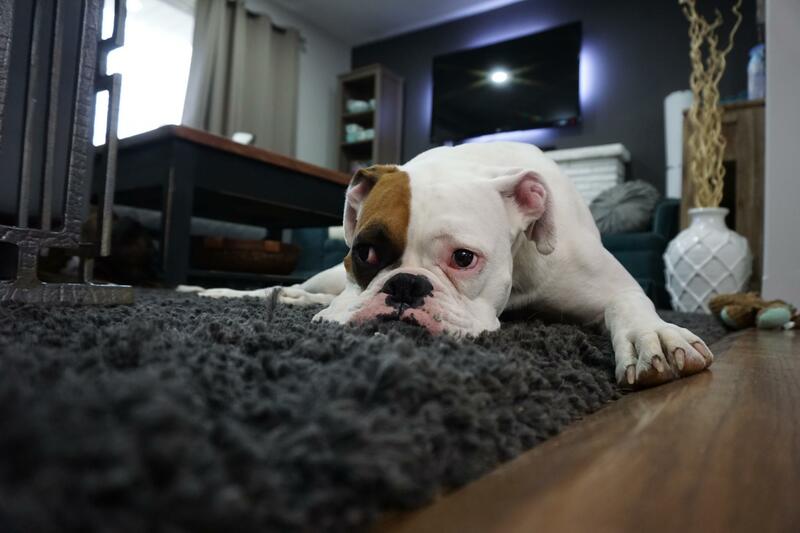 Leaving your dog at a dog sitter’s house might also bring homesickness to the pooch. So what are the symptoms of a dog being homesick? Dogs love gobbling down their favorite meals but not when they are homesick. A homesick pooch will in most cases not touch his food until he understands his surroundings or gets some reassurance from a familiar face. The anxiety and depression associated with homesickness in dogs do not allow them to enjoy meals. A homesick dog will just lay there looking very sad and whimpering. Of course, we have other dogs that will gobble their food down even in unfamiliar environments, but they are the minority. Homesick dogs tend to let out heart wrenching whines. Whining is a dog’s way of communicating their mental and physical state to the dog owner. In the case of homesickness, the dog whines while lying in a submissive position with his ears, head, and tail down. No matter how sad the whining is, you need to wait until your dog calms down before you do anything. Responding to your dog immediately he starts whining will train him to whine every time he wants something. You can help the dog calm down by sitting down close to him quietly until he stops whining. My Dog Won’t play fetch, with toys, outside, etc. A homesick dog is not very enthusiastic about playing. Even the most playful dog will act out of character and won’t be willing to play when homesickness sets in. In most cases, the dog will lie there whining, or cuddle up to you if you are present. It is just a way of trying to cope with the new surroundings. Sometimes giving the dog his favorite toy may help but it is not guaranteed. A homesick pooch will in most cases be unwilling to relieve himself. Most house trained dogs have a feeding and toilet routine. They have a designated feeding place and a designated place to poop. When the dog is plucked from his usual environment, he gets confused on where he should relieve himself in the new surroundings. The confusion conflicts with his house training and he just decides not to relieve himself. As a dog owner or sitter, you should have a place set apart where the dog can relieve himself. You should also give the dog a treat when he relieves himself in the designated area. This reinforces the good behavior and encourages him to relieve himself. Dogs are by nature pack animals, and that has not changed even after 15,000 years of domestication. Your family is your dog’s pack, and you are the alpha. Just like any pack animal, dogs thrive within their pack and territory. In this case, the pack’s territory is your family home. Dogs love their pack, and they respect their alpha. They also feel most comfortable when they are within the territory. When the dog is separated from the pack or plucked from the pack’s territory, he develops separation anxiety and home sickness. The reason why a dog will feel homesick when you travel is that he is not in a familiar territory even if all his pack members are present. There are two scenarios when your dog can get homesick. When you are away and when you are present but in a different environment maybe when you are traveling. If you are going away, you will need to leave your dog with a dog sitter. If you leave your dog at the sitter’s house, the dog will feel your absence and most likely develop homesickness. Packing a few of your dog’s favorite toys and a blanket that smells of you may help calm things down. If the sitter is dog sitting in your house, the dog may develop separation anxiety when he notices your absence. Your sitter can take the dog out for a walk or play with him to distract him. Leaving him a blanket that smells of you also helps. Travelling with your dog might sometimes cause him to develop homesickness. If this happens, you will need to distract him from concentrating too much on the new surroundings. You can play a game of fetch or take the dog out for a walk. Alternatively, you can take the dog to a dog park if he is a social dog. Interacting with other animals can ease homesickness. When you get back inside, you will need to stay close to your dog for the first few days. Leaving the dog alone in new surroundings will make homesickness even worse. The good thing is that homesickness does not last very long. With proper care and attention, your dog can get used to the new surroundings in a matter of days. Most dog owners may panic when their dog starts exhibiting symptoms of homesickness. It is, however, no cause for alarm as homesickness is a manageable condition. A disruption in routine is undoubtedly going to cause some stress on most dogs. How you handle it, however, will determine how soon your dog gets used to the new surroundings. Make sure to get a good dog sitter that your pooch likes whenever you travel. If you are traveling with your dog, make sure to get spacious accommodation so that your dog can have enough room to move around.